Designing & developing Aero engine is one segment where India has been completely dependent on imports till date. With the huge requirement of aerospace platforms in coming years by the Armed Forces, the need of the hour calls for indigenous development of the engine by the Defence Industrial Base (DIB). As India is moving on with its path of modernization of its Armed Forces, the one prominent gap that remains and has been acting as a major obstacle is the inability to design and develop wholly indigenous modern aircraft engines, which account for about one-third the cost of a new military aircraft. There are many types of aero engines depending on the platforms, such as turboprops, turbofans, and turbojets. The principal aim of military aircraft engines is to deliver performance and fuel efficiency with reduced noise and emissions. CFM International, General Electric, International Aero Engines, Pratt & Whitney, Rolls Royce are some of the global OEMs manufacturing world class engines. This is one segment where India has been completely dependent on imports till date and has been procuring from countries such as United States (General Electric, Honeywell and Pratt & Whitney), Europe (Rolls-Royce and Snecma) and Russia (Klimov and NPO Saturn) in the past to meet its growing requirements. 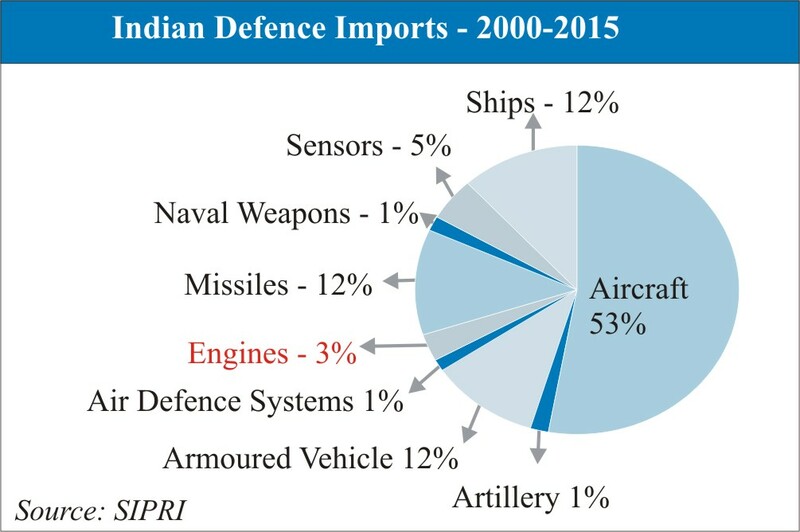 In the last 15 years, India has imported engines worth $1267 Million accounting for 3% of the total Military imports by the country. With the huge requirement of aerospace platforms in coming years by the Armed Forces, the need of the hour calls for indigenous development of the engine by the Defence Industrial Base (DIB). However, as of now, the indigenous development of aero engines hardly seen any progress; reasons being that engine manufacturing being high technology and capital intensive and the country still does not have the technology know-how required in building engines. In India, till date, only DRDO and HAL have been designated as the entity for designing and developing engines. DRDO undertook the development of indigenous GTRE GTX-35VS Kaveri, an after burning turbofan engine, in 1989 with probable date of completion of 1996 which was extended to 2009. The indigenously being developed Kaveri was originally aimed at powering the LCA Tejas being built by the Aeronautical Development Agency (ADA). However, the aero engine developed by DRDO was unable to achieve the required thrust to power LCA and thus was officially delinked from the Tejas programme in September 2008. While the Tejas needs an engine with 82-90 kN of peak thrust, the Kaveri has only managed 72 kN during flight testing in Russia. The DRDO finally winded up the Kaveri engine (GTX-35VS) programme on November 2014. The Government has spent Rs 2,101 crore so far on the development of the engine. Till date, total of nine Kaveri prototypes and four Kaveri Core Engine prototypes have been developed and accumulated more than 2550 hours of engine testing. The Kaveri engine was also integrated with IL-76 Aircraft and flight tested. As of now, it has been decided to use Kaveri derivative engine ("dry" engine) without after burner for powering Indian Unmanned Combat Aircraft, tentatively called as Autonomous Unmanned Research Aircraft. The UCAV programme has been given 8 years deadline to get completed. In Nov 2015, it was reported that the Government is set to give a nod to develop Kaveri derivative engine ("dry" engine) termed as 'Ghatak' worth Rs 3000 Crores soon. Also the Government is determined to involve the private sector in this project. The target is to get the system operational within 8 years once the funds are cleared by the Government. Recently France had offered to invest $ 1bn to revive India's Combat Jet Engine project Kaveri, Proposing a joint development plan. HAL, is the only real Indian player in the domain of engines, whose engine division has a long history of license producing various imported designs. Currently, HAL is building engines under transfer of technology for all aircraft acquired from Russia in the recent past like the AL-31 FP for the India's Air force's Su 30MKI and the RD-33 MK for the Indian Navy's Mig 29K.The DPSU also had been building Artouste turboshaft engine since 1961 to equip the Indian Chetak and Cheetah helicopters under manufacturing license granted from France's Turbomeca. Basically, HAL/Turbomeca Shakti is a turboshaft helicopter engine and the programme to develop was initiated in 1999 by the two companies to power the HAL Dhruv helicopter. By late 2007, HAL started fitting the Shakti engines for Dhruvs produced by them. The Shakti engine which powers the HAL Dhruv, HAL Rudra, will also power the HAL Light Combat Helicopter (LCH). It is an up-rated version of the Turbomeca Ardiden and was developed under the aegis of a HAL-Turbomeca joint venture. HAL has also entered into key joint venture partnerships in this domain with global OEMs like Rolls Royce and Safran to manufactures high-tech components for aircraft engines. HAL has also undertaken a project with its internal resources for indigenous design and development of turboshaft engines. And, recently HAL achieved a milestone with the successful completion of the inaugural run of the core of 25 kN indigenous Aero Engine (Hindustan Turbo Fan Engine - HTFE 25) which was completed in June 2016. It can be used for basic, intermediate and advanced trainer aircraft beside business jets and five ton weight class aircraft in single engine configuration and on aircraft of up to nine ton weight class with twin engine configuration. Around October last year, it also initiated the design of the second one, HTSE-1200, meant for 3-tonne to 6.5-tonne helicopters. The HTSE-1200 can be used for helicopters of 3.5 ton class in the single engine configuration (e.g. LUH) and for 5 to 8 ton class in twin engine configuration (e.g. ALH, LCH). The engine develops a power of 1200 kW at sea level and can operate up to an altitude of 7 km. Both the projects are expected to reach fruition by around 2020-21. A tender of joint venture on development of the engine for the fifth-generation fighter Advanced Medium Combat Aircraft (AMCA) has been issued to Engine manufacturers in 2015 to seek foreign partner for helping in developing the engine by combining both Kaveri engine technology with the joint-venture partner's engine to produce an engine capable of producing thrust of 110-125 kN. The tender has been issued to General Electric (F414), Pratt & Whitney, Rolls Royce (EJ 200), Snecma (M88), NPO Saturn (AL-31-117) to produce 110-125 KN of thrust. France has offered help in development of AMCA's engine with full access to the Snecma M88 engine and other key technology, while United States has offered full collaboration in the engine development with full access to the F-414 and F-135. Rolls-Royce is also pushing a deal on Joint-Venture engine by offering co-developing a new engine based on Kaveri engine and EJ2XX engine. US has already has signalled its willingness to co-develop with India an aircraft engine. As of now, the presentation by five to six global aero-engine manufacturers is over The DRDO is likely to zero in on a partner within this year. The target is to integrate the engine into the aircraft by 2019. 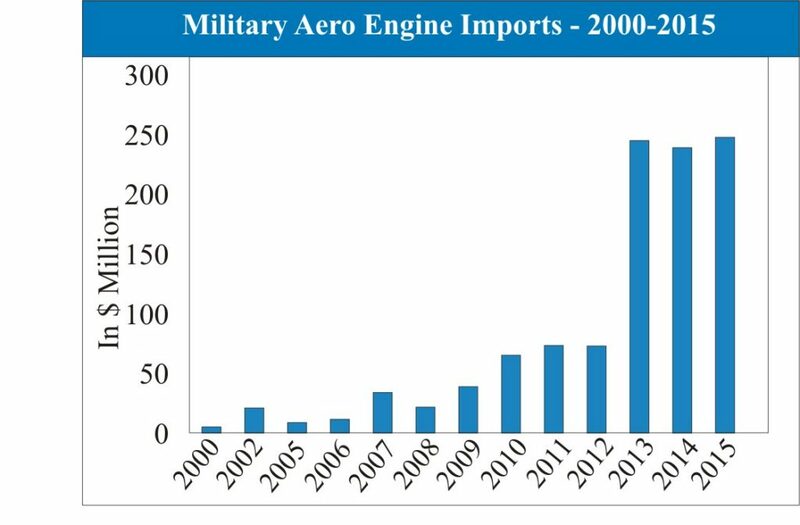 Considering the various fleet replacement programs, modernization strategies and aircraft upgrade projects coupled with increasing defence expenditure, the Indian military aircraft engines market is poised to grow year on year. Some of the major engine procurement programmes in near future includes Light Transport (AVRO), Light Transport (AN-32), LCA Tejas, AMCA and these entails procurement of around 3400 to 4000 engines approximately. Refer Table. The Indian Armed Forces are planning on the largest helicopter procurement programmes and their requirements aim at strengthening the military helicopter assets through the procurement of 1000+ rotary wing aircraft including attack, utility, multi role and lift platforms by the end of 2027. Projections depict that the country would need 4000 to 6000 helicopter engines by 2020 itself. Noteworthily, an aero engine's life is about 1,500 hours; each fighter - with a service life of 5,000-6,000 hours - consumes around 3.5 engines and development of each engine costs around $2 Billion. Hence, there seems to be a huge demand. Similarly, each Heli consumes three to three-and-a-half engines over its service life, while the twin-engine choppers will each require six to seven engines, with total market size of about Rs. 50,000 crores. The Defence Ministry estimates that India's military aero-engine market will amount to Rs 350,000 Crores over the next two decades which means around 17500 Crores per year. Noteworthily, the opportunities span the entire spectrum from supplying engine components to providing Maintenance Repair and Overhaul (MRO) services. In fact, MRO related expenses can often exceed the initial procurement cost of an engine. Maintenance which includes dismantling, inspecting, assembling and testing aircraft engines is however the single largest MRO segment. Engine Maintenance constitutes 35 percent of the overall cost of maintaining an aircraft. More than two thirds of engine maintenance is taken up by the cost of materials, with labour accounting for another 22 percent. India's MRO segment is expected to grow to 3 billion dollars by 2020. On the backdrop of absence of technology know how to develop engines; a lot of requirement will be met via imports or co-development creating a very large offset opportunity for India's emerging aerospace industry in this domain. Thus, lucrative opportunity is also seen for foreign manufacturers as well especially those who view India's potential as an opportunity to outsource manufacturing work, partly due to offset requirements and cost benefits. Till date, HAL has been single source of engine/major engine component production in India and, thus, a lot of the business is likely to go to HAL which is already burdened with contracts. This situation can be averted if the Government involves and boosts the private sector participation. Time has come to amalgamate the expertise and competence available in both the public and private sectors of the country and should be fused to create a high tech platform for developing aero engines. Indeed, resources available in private companies such as TATA Power, L&T, Kirloskar and Godrej could be harnessed for giving a quickening impetus to build a vibrant technological base for realizing aero engines of varying thrust ranges. Steps have been taken by the Government in this regard. Awarding of the contract to TATA who has a joint venture agreement with Airbus for AVRO replacement programme substantiates this fact. TATA will act as the Indian production agency in this programme and will be involved in every step including engine developing. Apart from this many more aero platform procurement programmes in pipeline under 'Buy-Make (Indian)' category wherein private sector has been given a chance in participating. Aero engine components are likely to be sourced domestically which include nozzles, turbine blades and vanes, drive shafts, flexible couplings casings, compressor, housings, stators and sub-assays. Thus, there would be plethora of opportunities and ample business for existing Tier-2 (those companies who will build engine hydraulic systems, electrical power systems etc.) and Tier-3 (companies that are into casting and forging capability and can build fasteners, bearings, wiring harness and machine structural sheet metal) players. The tier-3 segment, which is still upcoming, in particular is likely to see a coming up of new companies. The market would also pave way to Joint ventures/MoUs between foreign and Indian firms. For instance, Wipro Infrastructure Engineering has a MoU with Spanish company CESA (Compania Espanola de Sistemas Aeronauticos SA), a subsidiary of the EADS, for the manufacture of precision engineering components including hydraulics. Further, it is anticipated that in the field of Engineering Services alone, the current market, which stands at $1 billion, is expected to triple over the next three years and would be reaching $12 billion by 2020. Engine manufacturing being complex and high technology, costly, capital intensive and time consuming process and the country still does not have the technology know-how and capital required in building engines. Lack of infrastructure, manufacturing and test facilities within the country and non-availability of skilled or technical manpower in the field of aero-engine technology are also some of the other reasons. With the only Tier-I HAL being over burdened and foreseeing the growing requirement of engines in coming years, there is definitely a need to create a parallel entity by involving private sector companies. Clearly, developing and producing aero engines indigenously could India becoming independent from its costly and continued dependence on global engine majors. India has also taken the co-development path which can prove to be beneficial for India as it would get a chance to know and learn about the complex technologies such the high-melting-point alloys and gain experience in production and design of jet engine components, needed to build the gas turbine where it lacks coupled with the co-development projects when undertaken would provide work to Tier-2 and Tier-3 companies. Tapping into the experience of any of the experienced and expert company in this field would help the DRDO overcome some of the hurdles that has derailed the Kaveri programme.